In my view, 50% of a successful weight loss effort is knowledge, while the other 50% is psychological. Half is knowing what to do, while the other half is having the willpower to make yourself do it. Determining what to do is not the hard part. Good advice on how to lose weight can be found all around you (including on this site). But following through and doing it, day after day - that can be very hard. So don't neglect your mental game plan. Having the right mind-set can be the difference between success and failure. I wrote about weight loss affirmations as one powerful tool for your mental toolbox. My favorite affirmation for fat-loss emergencies is, "Just Do It Now!" Do the right thing now. You'll never regret it. "Just do it now" is a personal rallying cry that will get you to push forward when you feel like doing anything else in the world rather than training and eating clean. While he used it to achieve greatness in the realm of bodybuilding, it works equally well for the rest of us who are just trying to lose some fat and get in decent shape. At the grocery, you notice a new flavor of ice cream. You see from the label it's high in fat and sugar, but one pint won't hurt, right? Stop! 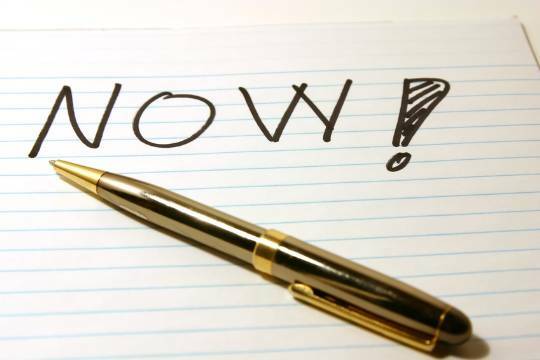 Think "Just Do It Now" - do the right thing now. This simple thought jolts you out of your trance. It helps you put the ice cream down and walk away. Last night you set your alarm clock for 5:30 a.m. so you could get up early and have time to exercise. As soon as the alarm goes off, though, your mind betrays you. You're so tired, maybe you'll just sleep in. You'll exercise in the afternoon or perhaps tomorrow. Stop! Think "Just Do It Now" - do the right thing now. If you think this forcefully ("loud") enough, you will jump out of bed and keep your commitment. Most of us are very good at talking ourselves out of things we don't feel like doing. This can become such an ingrained habit that it will go on for the rest of your life if you let it. But remember, you are the one in control. Add "Just Do It Now" to your mental arsenal. Use that phrase to fight back against cravings, laziness, procrastination, and rationalization. The reward comes sooner than you think. Not long after you resist that sweet food or complete that exercise session, you will feel a huge boost of confidence! Your subconscious knows when you've used willpower to do something that's good for you. And it rewards you immediately with a glow of satisfaction and sense of well-being.